“Blood Inside” comprises of a square 5×5 grid framed by 32 cells, similar in form to the pre-marked surface on a gaming board or ritual table. The central image is a 6x6x6 triangle [a pattern donating organisation, advancement and stratification]. 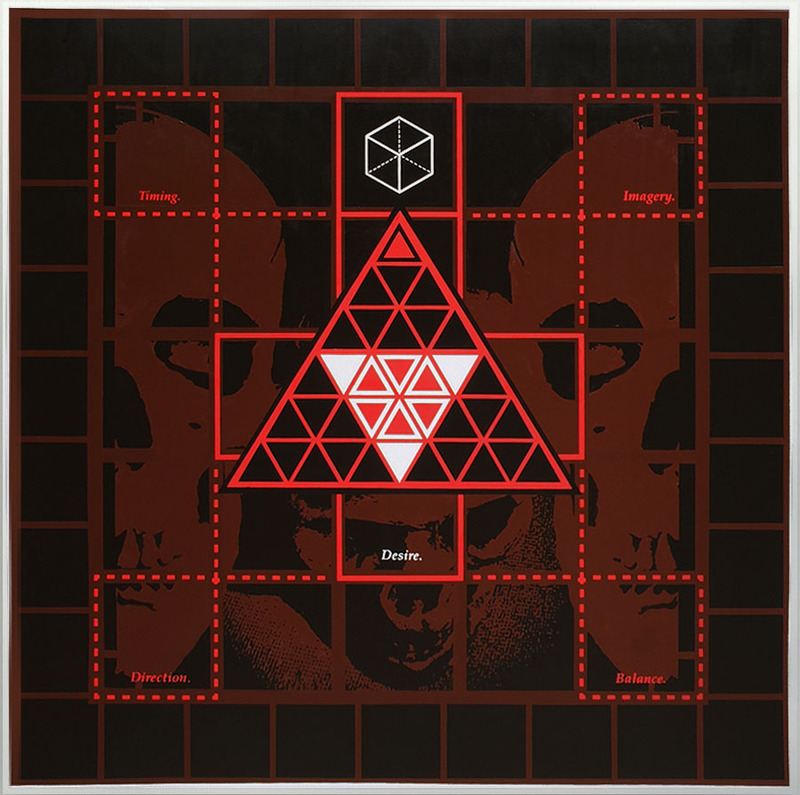 There is a flat plan of a cube forming an inverse cross and a collection of staring, forward facing skulls, a momento mori reminding us that life is a game born from chance and lived vitally through competition. The inverse cross shape is ordered both by the layout of the grid and by the system on the game, its factors of play. These 5 factors are Timing, Imagery. Direction. Balance. Desire. These are also the material mechanics used in ritual practice with Desire highlighted to emphasise that appetite and passion are needed for success. At the top of the composition is the Platonic symbol for the Earth, the hexahedron or cube which draws the eye to the peak of the triangle, raising materiality above all else to its apex. See also: ‘The Twin Poisons of Jealousy and Success’ (2015) by Fergal T. Fitzpatrick. See also: ‘Love God Harder from Within the Red’ (2015) by Fergal T. Fitzpatrick.